Thanks for looking...be back tomorrow with a LIM card ...cant wait....Can you !!!! This is a fabulous Christmas card. I love the colours and the colouring is beautiful. Gorgeous card Sylvie, the sweet image and the details. Fabulous Christmas card Sylvie...just love the PB image you have used. Its just gorgeous Sylvie. What a perfect image. I need to hunt for a postbox, not sure if there is one here or not, may have to go to a cd:0 Love the icy background papers. Love it !! love the icy border !! Well done you for getting the post box too! Love this card too Sylvie great image. 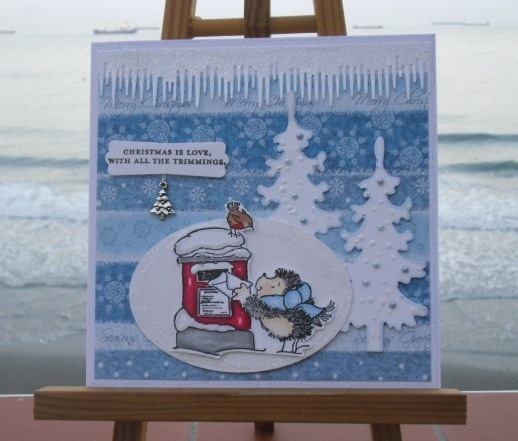 I love Penny Black and especially the hedgies images so this is extra cute to me! I really love it! Super xmas trees on the side, very inspirational. Hope the weather is kind to you! Fab card Sylvie great design and colour.